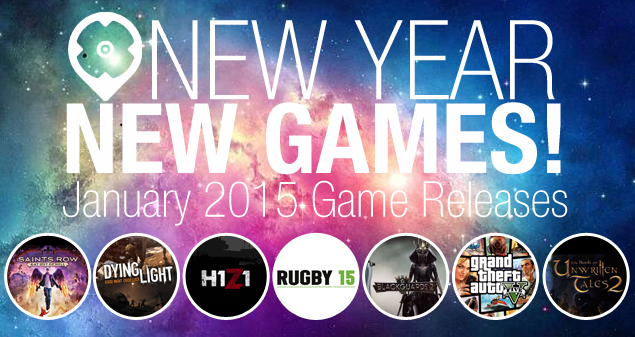 Let’s welcome 2015 with a loud bang as the new year also brings us new game releases! From RPGs, survival games, to FPS, we’ve got you covered, so check out our top picks for January 2015. Did your favorite make the cut? Which of the games below are you looking forward to playing? Let us know in the comments! 1. Saints Row IV: Gat Out of Hell is set to be released on January 20,2015 for Xbox One and Playstation 4. Alone with a brand new adventure, Johnny Gat is on a mission to tear up Hell and shoot the Devil in the face. 2. Dying Light is an action survival game presented in first person. It allows you to travel an open world full of chaos and destruction. During the day, you roam a city devastated by a mysterious epidemic, look for supplies and craft weapons to help you survive the hordes of mindless monsters created by the plague. At night, you become the hunted as the infected become stronger and more aggressive. 3. H1Z1 is a massively multiplayer online role-playing game set during the zombie apocalypse. Set in the wasted United States during the zombie apocalypse, players will find themselves roaming the city for shelter, food and resources to survive. Players may be out to manipulate you; some may be there to help – but beware of who you trust. Band together or fight each other? Your choice. 4.Rugby 15 is the much awaited rugby game of 2015. It’s a complex game with so many intricate rules, bringing all of the different elements of the sport to a video game is not easy. Overall, It has brought all the components of the sport together to make one fun and exciting game. 5. Blackguards 2 is a “dark” fantasy turn-based RPG focused on strategic battles and epic quests. It will still be based on the RPG rulebook of Blackguards, but it will come along with some revisions, optimizations and some simplifications. If not in battle, players take care of a lot of quests and the development of their characters. As common in RPGs, the quests will offer optional and alternative plotlines. 6. Grand Theft Auto V for PC?? Yes! This awesome GTA game features the all-new First Person Mode. Players can explore the incredibly detailed world of Los Santos and Blaine County in an entirely new way across both Story Mode and Grand Theft Auto Online. 7. The Book of Unwritten Tales 2 is a third person point and click game. If you liked the 1st installment the 2nd game is definitely a must buy for you. It’s funny and well written, it’s colorful both in tone and appearance, and the voices are really good. The story, characters and humor places the on top of the adventure game genre.